What we like about Recoil is that it takes an already popular concept like Laser X and enhances it with the use of a phone. A considerable number of UK children have a phone by the age of 11, so it makes huge sense for toy manufacturers to combine iOS or Android apps with their products. Especially for augmented reality gaming. Recoil is a perfect example of this. It uses a smartphone, a Wi-FI base station and a couple of blasters to turn any indoor or outdoor space into a digitally-enhanced, multiplayer battlefield. The concept is simple; think Laser Quest with smartphones, basically. It's from big name toy maker Vivid and is out this summer. A pack comprises of two blasters, a box of tricks to make it all happen, and you have to supply the phone, of course. Like laser blaster games from years gone by, including the more recent Laser X, the idea is straightforward. Shoot your opponent while avoiding their fire and you win the game. But rather than just another laser offering, a smartphone app is core to the experience. And it enhances the fun greatly. The blasters are fairly advanced, even though they are the least tech-packed part of the experience. 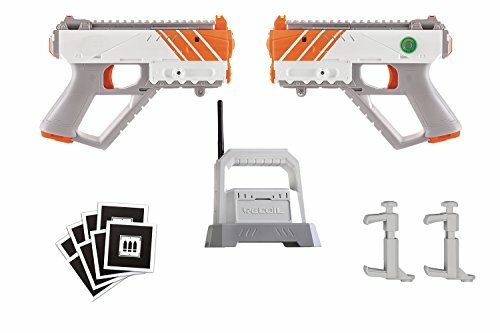 Looking like Nerf blasters, minus the darts, there are two hand-held, mid-sized "Spitfire" blasters included. They are held more like pistols than rifles and have some haptic movement. You press the trigger and the gun recoils to give you that "just fired" effect - hence the name. A punch button on the base of the magazine also lets you reload your ammo, which is a cool addition. The Spitfire blasters, which are made with white and orange plastic, also feature a robust cradle to place your smartphone. Our demo included an iPhone 5S with the phone happily locked into place. We weren’t able to test it, but the cradle looked strong enough to keep the phone in place given that it is probably going to be swung around an imaginary battlefield by a 13-year-old looking for victory. Those wanting more can add to the two blasters in the starter pack (you always need two players). There is a much bigger assault rifle-style blaster, called Rogue, for example. Its shooting capabilities differ to Spitfire giving you better damage output, firing range and ammo capacity. There’s also a frag grenade, coming later, that you can wipe out opponents with by simply chucking it in their general direction. Key to the game is the Wi-FI box of tricks that you place in the centre of your gaming area. Looking like an ammo pack, you dump the box in the middle of where you want to play and it creates a mini mesh wireless network for around 250ft. The phones (Android or iPhone) or iPod touch devices then connect to the pop-up Wi-Fi network. Handily, it doesn’t need an internet connection itself, so you can play anywhere. It also means there is no need to use data on your phone to play. The accompanying app cleverly knows exactly who is doing what and where they are within the pop-up arena you’ve created. Gamers can, therefore, play both indoors and outside. That app brings all the pieces together. During the game, your phone will display a game screen with players’ health status, ammo levels and a mini map of the play area, all shown in real-time. You’ll also see how many times you’ve died, your kill status and other bits of intel. The app tracks where every player is, creates re-spawn spots to go to when you die (like on Call of Duty or other FPS games), or throw in extra treats like crates to give you extra ammo. It’s this part that could really bring the experience to life. This isn’t like the Merge 6DoF gun, simply trying to give you a virtual world to play in, but a full heads-up display and the sort of immersion that feels more like a console shooter. The app also controls the various game modes, with four available from the off: Skirmish, Team Skirmish, Capture the Flag and Indoor. The latter allows you to play indoors without GPS support for enhanced tracking. Recoil supports up to 16 players at a time, but sadly doesn’t come with a single player mode for target practice. What we like about Recoil is that it takes an already popular game like Laser X and enhances it with the use of a smartphone. The phone essentially becomes your heads-up display, giving this an FPS style experience. Unlike console games though, kids playing it have to run around, rather than just sit on the sofa. And so they at least get some exercise. Our demo at the London Toy Fair was brief, but we are keen to get a set or two and start blasting our way to victory when it comes out this summer. Recoil is already available in the US and will be available in summer 2018 in the UK. The range includes the Recoil Starter Set (£99.99), Spitfire Pistol (£39.99) and Rogue Assault Rifle (£69.99). You will need the Starter Set at the very least.